The month of September was,lets be honest, a fun one for the most part. That fun is expected to continue through a rather exciting looking October. The month kicks off with a really exciting Japanese Super Bantamweight title bout between defending champion Yasutaka Ishimoto and former challenger Gakuya Furuhashi. The bout is a rematch from a thoroughly engaging bout the two men had last year and should prove to be a very friendly bout again here. For Ishimoto the bout serves as his second defense of the title whilst Furuhashi is looking to gain both the title and avenge his defeat when the men first met. Female boxing doesn't get the attention it, sometimes, deserves. October has several notable female bouts, with possibly the best of them seeing WBC female Flyweight champion Jessica Chavez battle against 3-weight world champion Naoko Fujioka in a bout that really is mouth watering. Both of these are top, established talents and both know that a win here would see them strengthening their already impressive legacies. It's a great bout and both will come into this in fantastic condition. It may sound like hyperbole but this is possibly the best bout of the month. The early part of the month is rather packed and on the third we get an intriguing IBF Featherweight world title eliminator as Japanese veteran Satoshi Hosono, a 3-time world title challenger, faces Argentinian veteran Jonathan Victor Barros, himself a former world champion. The winner of this will be expecting a bout with Lee Selby in 2017 and both know that a loss here could be the of their career at the top level. Given the styles of the men and what's on the line this really does have the hall marks of something really exciting. The second Japanese title fight of the month comes on October 6th as the heavy handed Kenta Nakagawa faces former Korean Super Flyweight champion Hayato Kimura for the currently vacant Japanese title. The two men have had very different careers but should match up well in the ring with Nakagawa being the bigger puncher and Kimura being the more experienced and arguably more skilled fighter. The winner of this will pick up the title vacated earlier this year by Sho Ishida, who vacated in search of a world title fight. Staying at Super Flyweight, which may well have been the most interesting division over the last few weeks, October 8th sees unbeaten fighters Rex Tso and Ryuto Maekawa colliding for the WBO International and WBC Asian Boxing Council Super Flyweight titles. Of the two men Tso is the more well known, and the favourite by our guess, but can be dragged into a war by lesser fighters and this could potentially be a lot of fun as a result. Just over a week from the Chavez Vs Fujioka bout we get another intriguing female world title fight, this time between once beaten Japanese fighter Nana Yoshikawa and unbeaten Korean Eun Hye Lee for the WBO female Flyweight title. Coming in to this one Yoshikawa seems to be suggesting it's now or never and at 38 years old she may well be right. The 33 year old Lee is a former WBO female Light Flyweight champion champion and is looking to become a 2-weight champion here. The WBO Asia Pacific titles appear to be here to stay and Japanese fighters appear to have gone “in for a penny, in for a pound”. This is seen again on October 9th when once beaten Japanese fighter Hironobu Matsunaga travels to Daejon to face big punching Korean Je Ni Ma for the Light Middleweight title. The bout is a great test for both men who will likely be looking to use a win here to launch their careers towards bigger and better fights. Given the power of Ma, and his 12 fight unbeaten run, he should be favoured here, but Matsunaga has impressed recently and stopped a former Japanese Middleweight champion last time out. Things to look forward to in October! The month of September was a month with a few stand out days, October however looks mouth watering with numerous days of note. The new month kicks off with an intriguing debut in South Korea. The bout in questions sees Pakistani debutant Waseem Muhammad (0-0) battle against Korean local Min Wook Lee (2-2) in a bout for the South Korean (KBC) Bantamweight title. On paper it looks a strange one but Muhammad is based in Korea and AK Promotions seem to have invested heavily in the former Pakistan amateur stand out. A win for Muhammad as we may see him become the first Pakistan born fighter of real note. On the same card as Muhammad's debut we'll see an intriguing match up between Japan's Shusaku Fujinaka (12-5-2, 8) and American veteran Randall Bailey (45-8-0-1, 38), with the two men fighting for the WBO Asia Pacific Welterweight crown. Fujinaka isn't a great fighter but this bout has garnered real attention with Bailey, a former multi-time world champion, bringing genuine attention to the South Korean boxing scene. With Bailey contracted to AK Promotions this could end up being the first of many fights in Korea for the “KO King”. It's again minor title action that has our attention as Japan's fast rising Ken Shiro (4-0, 3) battles against unbeaten Filipino Rolly Sumalpong (9-0-1, 4) in a bout for the WBC Youth Light Flyweight title. We've been impressed by Ken Shiro since his debut, last year, and if he wins here we're expecting to see him fight for a Japanese title in early 2016. Sumalpong on the other hand has gone under our radar but did claim the WBC Eurasia Pacific Boxing Council Minimumweight title earlier this year and could himself be one to watch. ​On the same card as the Ken Shiro Vs Sumpalong fight is a potentially explosive Lightweight clash between Yoshitaka Kato (29-5-1, 9) and Ricky Sismundo (29-8-2, 13). This bout will likely go under-the-radar for many fans but it really does look like it could be a very special bout between two tough guys with under-rated power and under-rated skills. It is only scheduled for 8 rounds but it could end up being one of the best 8 round bouts of the year. In a genuinely historic bout fans will get the chance to see two Japanese fighters fight for a world title on US soil, the first time such a bout has taken place in America. The bouts will see current WBA Super Flyweight champion Kohei Kono (30-8-1, 13) take on mandatory challenger Koki Kameda (33-1, 18) in what is likely to be a must win bout for both men. At 34 years old Kono will be unlikely to get another shot if he loses here to Kameda whilst a loss for Kameda would end a horror year for the Kameda clan, which has also seen Tomoki lose twice and Daiki suffer a huge shock loss. A loss for Koki and the Kameda's really will have lost the appeal they once had. It's rare to have bouts with every ingredient, but we think we may have one here with hard hitting Kazakh king Gennady Golovkin (33-0, 30) facing off against Canadian destroyed David Lemieux (34-2, 31). Coming into the bout both men are major punchers and world champions, with Golovkin holding the WBA “super”, WBC “interim” and IBO titles whilst Lemieux is the IBF title holder. Potentially this has “FOTY” written all over it, though could be over in a blink of an eye given the power, and styles, of the men involved. It's been a while since a world title bout had us this excited, and we've got it admit it might be a while before we see another, equally as exciting, unification bout. Teiken promoted Nicaraguan sensation Roman Gonzalez (43-0, 37) looks to continue his rise to the top of the sport as he faces Filipino-American Brian Viloria (36-4-0-2, 22) in what looks to be another brilliant bout. Coming in to this one Gonzalez is looking for the 3rd defense of his WBC Flyweight title whilst Viloria is fighting to remain relevant in the sport. A win here for Gonzalez helps cement his place atop the pound-for-pound rankings and could move us a step closer to the potential super fight between the Nicaraguan and Japan's Naoya Inoue whilst a win for Viloria will give his career one more run at the top and continue his up-and-down career. In another title bout fans will get to see talented Filipino Donnie Nietes (36-1-4, 21) make his US debut as he defends his WBO Light Flyweight title against little known Juan Alejo (21-3, 13) of Mexico. The bout, which is to take place in California, is part of ALA's first US show and is part of their move towards establishing their outfit as a world wide promotional outfit. A loss for Nietes would be disastrous for both the fighter and the promoter, but he hasn't been matched hard here and it'd be a shock to see Nietes given any real problems. Former 2-weight world champion Naoko Fujioka (13-1, 6) looks to continue her brilliant career as she attempts to claim a 3rd divisional world title. The exceptional Japanese fighter faces South Korean fighter Hee Jung Yuh (15-2, 6) in a bout for the WBO female Bantamweight title in what looks, on paper, like a brilliant fight. Aged 40 Fujioka is certainly “old” but she's in great shape and will be favoured over Yuh, who has won 14 in a row. Interestingly Yuh is married to another fighter Young Kil Bae, who set to fight for a world title himself in early November. On the same show as the Fujioka/Yuh bout is a great test for one of Japan's most under-rated prospects, Hikaru Marugame (5-0, 3). The talented Marugame steps up massively here as he takes on the highly experienced Jonathan Baat (30-6-3, 14), a Japanese based Filipino. A win for Marugame is expected, but Baat has scored notable upsets in the past, including popping 4 cherries and this is clearly a dangerous assignment for the 25 year prospect. We get the second world title unification of the month a week after the Golovkin/Lemieux bout as WBC Atomweight champion Momo Koseki (20-2-1, 7) takes on WBA champion Ayaka Miyao (20-5-1, 4). This bout has been on the radar of fans for a while and is finally happening due to the fact both fighters have, essentially, run out of worth while opponents. We're expecting a lot of action here and although it won't be the cleanest action it should be sensationally exciting and amazing fun to watch. Interestingly the winner will claim a place in history as the first ever unified Atomweight champion. Japanese Featherweight champion Satoshi Hosono (28-2-1, 20) returns to the ring for his second defence in the space of about 9 weeks af he takes on the tough and gutsy Takuya Watanabe (36-5-1, 12). Hosono, a multi-time world title challenger, is looking to record his 4th successive defence but will be up against a man who simple doesn't know how to quit. Watanabe came to our attention last year, in the wake of his “bloody” bout with Jaesung Lee and having seen that war we suspect he'll go through anything in an attempt to claim the title. This could be the perfect bout to close out the month. It's fair to say that 2013 has been a great year for both ourselves and for boxing. Sure for us it's been our first year as a site, for boxing though it's been an excellent year with a number of brilliant fights almost on a weekly basis, plenty of controversies, a handful of upsets and some great KO's. In all honesty it's been on of the best years that we can remember with everything a boxing fan could dream about. With that in mind we've decided to celebrate 2014 with our first ever “Annual Awards”. This award system will be our way of recognising the key fights, fighters and performances of the year. Of course, with this site being “Asian Boxing” we have tried to keep things to fights in Asia for the most part. Kazakhstan's Middleweight sensation Gennady Golovkin has possibly been the stand out fighter this year despite stiff competition from a number of fighters. Any year where a world champion defends his world title 4 times is impressive, even more when he stops all 4 men and never looks in any trouble. Not only did Golovkin defeat Gabriel Rosado, Nobuhiro Ishida, Matthew Macklin and Curtis Stevens but he also did it without losing more than a round or 2 between those 4 fights. Sure the opponents weren't great for Golovkin but the WBA Middleweight champion is quickly proving to be an avoided fighter and with good reason. He's taking out the B grade Middleweights whilst the top guys seem happy to avoid a clash with him. If he continues to take out all willing challengers in 2014 he may well be forced to go to Super Middleweight just to look for willing dance partners. One man who has arguably impressed everyone this year has been Takashi Miura who has had a career defining year no matter what happens in 2014. He began the year by becoming the WBC Super Featherweight champion courtesy of a demanding victory over Gamaliel Diaz and since then has gone from strength to strength. In his first defense he went to Mexico and won a thriller with Sergio Thompson then ended the year by dominating Dante Jardon in what we expected to be a tough bout. Not only has Miura had a year to remember but he's also become the new Mexecutioner. After losing to Kazuto Ioka in a Minimumweight title unification bout in 2012 some may have expected to see Akira Yaegashi slowly fade away. Instead Yaegashi has had a 2013 to remembered and a year to genuinely celebrate. 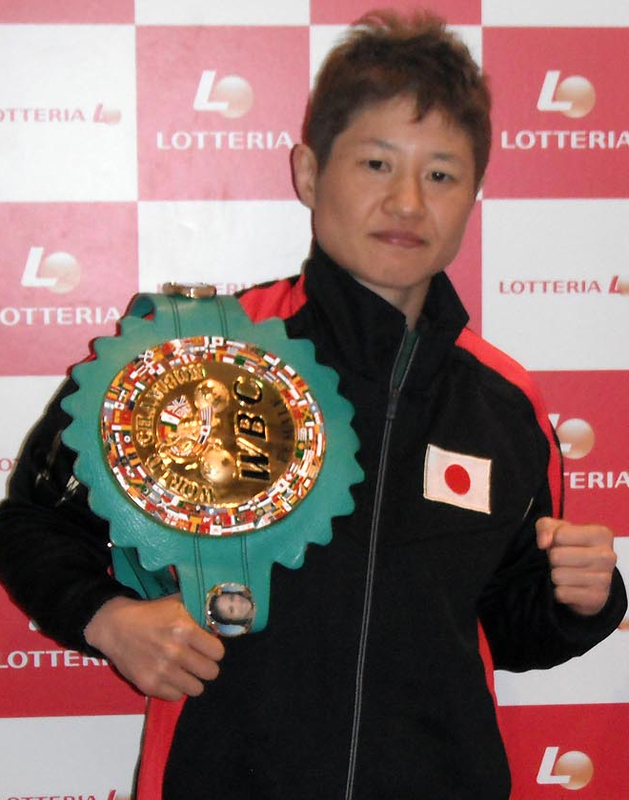 He jumped from Minimumweight to Flyweight and despite struggling with Thailand's Saenmuangloei Kokietgym in his first fight at the weight Yaegashi would end the year as the WBC and Linear champion. Yaegashi's year saw him scoring 4 wins including really notable ones over Toshiyuki Igarashi and Edgar Sosa and a very credible one over Oscar Blanquet. There was little doubt who'd be getting this award this year because Naoya Inoue was the one stand out candidate. The 20 year old from Kanagawa scored 4 wins this year and showed everything a fighter had to show. He destroyed Thailand's Ngaoprajan Chuwatana, boxed the socks off Yuki Sano, beat up the brave Ryoichi Taguchi and then dismantled Jerson Mancio. In the process of those 4 victories Inoue became the Japanese and OPBF champion whilst also becoming world ranked and viewed as one of the worlds fastest rising stars. Although the 18 year old Kosei Tanaka only made his debut this year he's already looking like a fighter heading to the top. Tanaka took on the well regarded Oscar Raknafa on debut and made a statement dropping Raknafa en route to a comfortable 6 round decision. His year wasn't as impressive as Inoue's but his performance showed the hall marks of a young fighter going a very way in the sport. Don't be shocked if this youngster is mentioned as the stand out prospect at the end of 2014. This was one the easier categories with Japanese Super Flyweight Naoko Fujioka having a year to really remember. She may have only fought twice this year but her win over Naoko Yamaguchi for the WBC female Super Flyweight title was the stand out performance of any Asian female this year. The former Minimumweight champion appears to be like a fine wine and despite being 38 years old she is still improving as shown as she defeated Yamaguchi and proved to be our female fighter of the year. Korean boxing might not be riding a crest of a wave but they do have a shining light in the form of WBO Minimumweight champion Su-Yun Hong who defended her title twice this year. He first defense, over Buangern OnesongchaiGym, may not have been anything great but the fact that she then followed that up with a victory over Mari Ando left us with no doubt that Hong deserved a mention on here. What made her victory over Ando so impressive is that Ando herself went up and finished the year a world champion herself. Back at the start of May we expected Yota Sato, the then WBC Super Flyweight champion, to travel over to Thailand and defeat Thailand's Srisaket Sor Rungvisai, a man who we admittedly knew little about at the time. Instead of Sato defending his belt and creating history we instead saw Srisaket have the break out performance of the year and stamp his name on the sport with one of the most notable and outstanding performances of the year. Japan's Koki Eto may be little known outside of Japan and Thailand and might never again make a statement on the world stage but his memorable battle with Pornsawan Porpramook was one of those great performances and the type of thing that will live on. Eto went in to the bout with everything against him. No Japanese national had won a world title bout in Thailand, he was facing an experienced and well known world level fighter and the crowd were certainly behind Porpramook. Despite the deck being stacked against him Eto managed to upset Porpramook with a stirring performance. Japan's Takashi Miura travelled around the planet to make the first defense of his WBC Super Featherweight title and take on mandatory challenger Sergio Thompson. Miura was the under-dog and the partisan crowd were clearly behind Thompson though they didn't prevent Miura from putting on a performance to remember as he and Thompson traded leather with reckless abandon. The fight wasn't Miura's first world title fight but was the fight that put him on the map as a real champion and a fighter who wasn't to be taken lighting. To start 2013 Srisaket Sor Rungvisai was an unknown fighter with a record of 16-3-1 (15). The only notable things about him were his early career losses to Akira Yaegashi and Kenji Oba. In 2013 however Srisaket went 7-0 (6) won the WBC Super Flyweight title dominating Yota Sato and made a defense of that title stopping Hirofumi Mukai. The American based “Siberian Rocky” Ruslan Provodnikov was viewed by many as a second tier fighter, an “ESPN fighter” if you will. This year though we saw Provodnikov proving that he was a world level warrior as he put on 2 fight of the year candidates. Although he came up short, narrowly, against Timothy Bradley his performance against Mike Alvarado solidified him as one of the revelations of 2013. We all know that Takashi Uchiyama is one of the hardest punchers pound-for-pound on the planet though earlier this year we saw just how hard he hits as be destroyed the mid-section of Venezuelan challenger Jaider Parra with a single thunderous body shot. The shot may be forgotten by many but for us it was one of the best body shots in recent memory, destructive. Like Uchiyama we all know that Gennady Golovkin is a major puncher and he showed it with 4 stoppages this year including 2 KO of the Year candidates. Of those 2 KO's we've gone with his single right hand KO of Japan's Nobuhiro Ishida, a shot that was vicious, concussive and spiteful. We're not sure what was more striking, the shot or the way Ishida went down with half of his body lying out of the ring. It was devastation of the highest order. Although Ryo Miyazaki may have ended the year with an unexpected loss to Fahlan Sakkreerin Jr one thing that no one can take away from him was his KO of the year contender against Carlos Velarde. This KO, which came way back in May, was probably the best 2-punch combination Miyazaki has ever landed and was simply a perfect combination that sent Velarde crumbling instantly to the canvas. It genuinely was a beautiful highlight to Miyazaki's first world title defense. This was by far the hardest category out there though we've gone with Miura v Thompson as the winner. This war, fought in Mexico was nothing short of breath taking with both men being sent down, both men being hurt, both men unloading and both men needing to dig deep. Neither man looked likely to survive the distance and neither man looked likely to be the same fighter ever again. This was one of those wars that will live on with all those that saw it and will grow and grow as the men themselves become more famous. When we talk about Fight of the Year we think of bouts with momentum shifts, styles that contrast well and a mix of the action. That's exactly what we got when Provodnikov put his name on the boxing map with his performance against Timothy Bradley. Of course Bradley played his part as had to battle through a serious shellacking and showed off the classy boxing we know he has in his arsenal. The bout had it all and best of all seemed to cause the birth of a new boxing star in Provodnikov. Japanese youngster Koki Eto was a relative unknown to the world stage until he travelled to Thailand and put on a real show with Thai tank Pornsawan Porpramook. The both saw both men going to war in a real battle of attrition that eventually saw Pornsawan dropped to the canvas in round 12. It turned out that it was the knockdown that sealed the deal for Eto and won him the WBA “interim” Flyweight title. Unfortunately Eto would lose the title in his first defense showing that the bout had taken it's toll on him. We said it was a tough category and the fact that Kohei Kono's war with Liborio Solis is all the way down in the 3rd notable position says it all. This fight could well have been our fight of the year in previous years as both men went to war, both men gave it their all and both men got knocked down in a bout that saw Solis unifying the WBA and WBA “interim” Super Flyweight titles. When a fighter goes 1-3-0-1 in their previous fights you tend to feel their career is on the wane and that it's time to think about retirement. For Katsunari Takayama however 2013 has been his year as he's scored 2 wins and put himself back on the map. Not only did he claim a world title, the IBF Minimumweight belt, with a memorable performance against Mario Rodriguez in Mexico but he then returned to Japan to win his first fight in the country since 2009. Takayama, aged 30, looks to be a man who has turned his career around this year and now looks like a very difficult man to beat. Before we close out our awards we want to say thank you to all the fighters, promoters, organisations and everyone else that has made our sport so great over the last 12 months. It's been an honour to watch these warriors in action. One more thing before we end this, we'd also like to say, from the entire team, thank you to...you. Thank you for reading, thank you for supporting the site and thank you for supporting boxing, the greatest sport in the world. Hopefully 2014 will be an even better year with more great fights, more amazing KO's and more of the action that has made us all love this fantastic sport.